Bill Woolsey has been all over Kling's case for making these assertions and the assumptions behind them. I will speak in a moment to Woolsey's critique but for now I want to see what the data says about the assertions (1) - (3). So the assertions (1), (2), and (3) are empirically falsified. Of course we did not need my VARs to know this. There is already a lot of empirical evidence out there that reaches a similar conclusion. Moreover, Bryan Caplan notes numbers (1) and (2) fly in the face of everything we know from hyperinflation experiences. So why make such assertions? Bill Woolsely explains that Kling's assertions can work if prices are sticky in the short run, real income is determined by productive capacity, and real money demand is not affected by real income. As Bill Woolsely notes, this last assumptions is incredibly wrong, as many empirical studies have demonstrated over the past 50 years. In light of the evidence I say it is time for Arnold Kling to join the ranks of the monetary disequilibrium bloggers. Update 1:Here are some definitions to add clarity to the figures above. The real stock price series is the real S&P 500, the debt series is financial sector debt to GDP, the money supply is the monetary base, and the real money balance series is the monetary base divided by the CPI. Update 2: Josh Hendrickson provides a nice follow up to the issues raised here while Arnold Kling assails my use of the "Dark Age Macroeconomic"-based VAR. David, there are some serious problems using TIPS to get expected inflation as its contaminated by other factors, see Carlson & Fuerst, Cleveland Fed Letters 2004. Maybe using some survey of inflation expectations or perhaps doing an ARIMA model of inflation and using residuals would get around this problem? "In other words, an unexpected positive increase in the monetary base historically has led to an increase in the short run of real economic variables." Ooh...I'm not buying that bag of rotten apples David!! 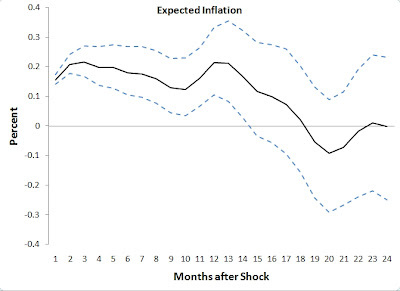 Last fall we had the mother of all positive base shocks and we're still waiting for the increase of real variables!! Yes, I know the TIPs data is plagued with a liquidity premium and went looking for the Cleveland Fed's adjusted expected inflation series that corrects for it. However, they took it down because of the crisis. I also thought of getting survey data on expected inflation, but given time constraints I settled for the crude TIPs. So is there a place I can get survey data at a high frequency that won't cost me a fortune? With that said, an easy fix to the model is to include a money multiplier term. I just happen to have a paper under review right now that does just that. 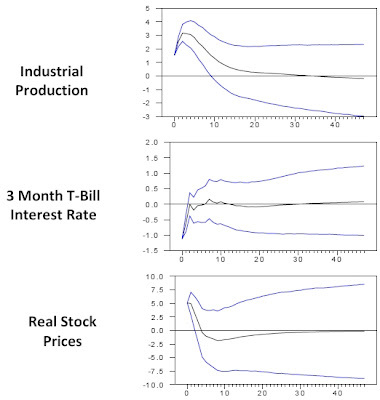 It questions whether monetary policy has any effect on long-term interest by looking at the effect of monetary base shocks and controls for the money multiplier. It can be found here. Any comments you have on the paper are welcomed. I hate to just prove my ignorance, but I was puzzled by ECB's claim that there was a surge in base money over the last year and no real response. To me, that would suggest that if base money had remained at roughly 800 billion, then all the real variables, expecially real GDP, would have been the same. My humble opinion is that if the monetary base remained at 800 billion or so, then real GDP would have been much lower than it is today. And so, there has been a real response to the increase in base money. I would interpret this empirical data as showing that other things being equal, an increase in the monetary base will raise real output. Does the data here purport to show that there is no possible way for a financial panic to depress real output? I am not interested in proving the claim that if base money grows at a stable rate, then nominal income, real income, or anything else will grow at a stable rate. If that were true, it would be nice to know, of course. 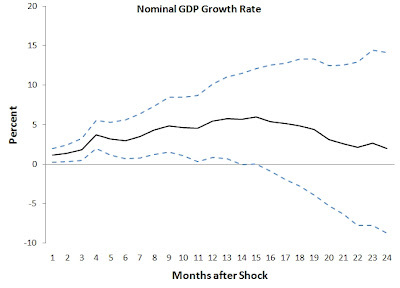 The question at hand, in my view, is whether or not any other things that might lead to lower nominal expenditure and real output can be offset by a sufficiently large increase in the monetary base, so that nominal expenditure will continue to grow on target, and hopefully, real output will suffer less disruption. If changes in the monetary base never impact nominal income or real output, that would seem to provide some evidence that sufficiently large increases in base money would not offset decreases in nominal expenditure and real output. 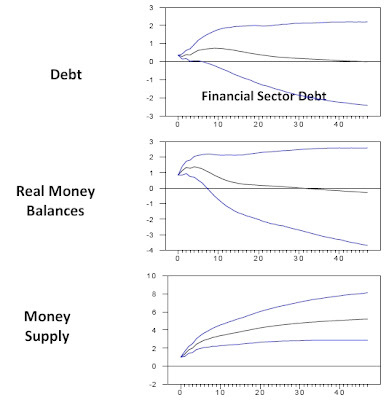 Since this evidence suggests that changes in base money do in fact tend to have a positive impact on nominal expenditure and real output, then it remains possible that sufficiently large increases would offset other factors tending to depress those things. Please explain to me how I am wrong about this so that the the fact that real income fell at the same time base money rose is inconsistent with my understanding. That is a good point Bill, you are being a better econometrican than me in interpreting my results. Yes, the results do show the effect of a monetary base shock holding all else equal(i.e. the model controls for the influences of the other variables). Therefore, they do imply as you suggest that had the monetary base been frozen since 2007 that the crisis would have been far worse. A good way to make your point would be to compare the present crisis to what happened in 1929-1933. Then, the monetary base grew at a mild pace while the economy was collapsing around it. Bernanke did not let that happen--and proably should have done more--and as a result the economy has fared better than it did during the early part of the Great Depression. Regarding your financial shock question, I only imposed restrictions on the model that allow me to pull out monetary base shocks. It is possible, however, to impose other restrictions that would allow one to pull out the effect of financial shocks. I just didn't do it. Should Monetary Policy "Lean or Clean"?